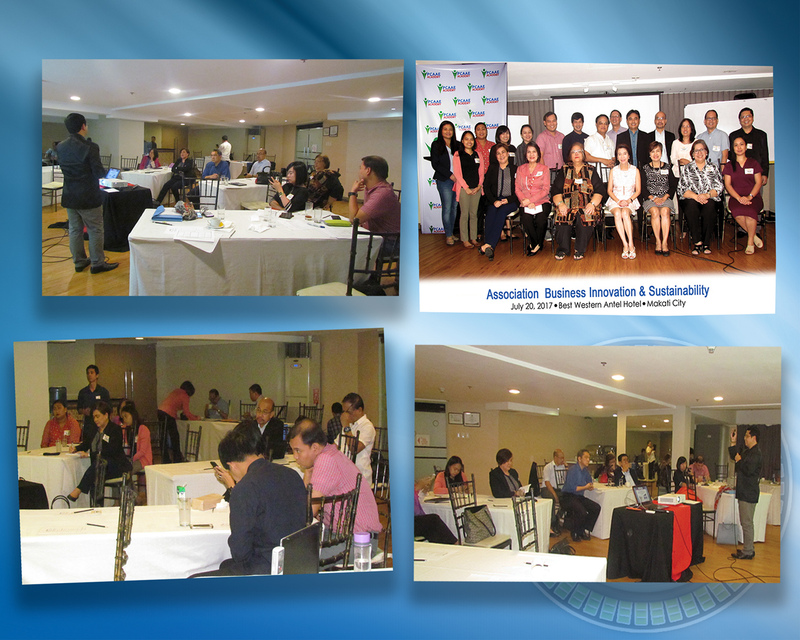 The PCAAE Academy, the career and development center of the Philippine Council of Associations and Association Executives (PCAAE), conducted a seminar on “Association Business Innovation and Sustainability,” on July 20, 2017 at the A Venue Hotel in Makati City, Metro Manila. The event was attended by twenty (20) PCAAE members who earned additional credit towards becoming a certified professional association executive (CPAE). The CPAE program was developed by the PCAAE to further professionalize association governance and management in the country and offers excellent career opportunities and growth for those already working or those considering to work in the association sector that includes Board members, officers, staff and professionals. The one-day seminar was composed of morning and afternoon sessions that discussed the different components of a successful business model framework and a lecture and workshop on corporate reporting as a key for strategy and communications for associations. The morning session thoroughly discussed the different aspects in developing a winning strategic business plan, including the business model canvass; business organization as an important component of the business model framework; business target which focused on the organizational key performance indicators (KPIs) and key results areas (KRAs); organizational branding; technology for associations; and human resources management. After the discussions, the participants were instructed to draft and present their own business plans, based from what they have learned, using the business model canvass. While the afternoon session discussed and dissected the importance and benefits of sustainability reporting as a means of communicating the organizations achievements in consonance with the international reporting standards. In addition, the session shared the experiences of the Association of Development Financing Institutions in Asia and the Pacific (ADFIAP) in sustainability reporting that it started in 2008, using the GRI Reporting Framework. The resource speakers consisted of members of the ADFIAP Consulting (AC) team led by Ms. Cora Conde, Group Head; Atty. Alberto Reyno, Managing Principal; Ms. Arlene Orencia, Head of Projects and Programs; Ms. Cristy Aquino, Head of Business Development; and Ms. Cecile Ibarra, Head of Advocacy and Training. Mr. Enrique Florencio, ADFIAP Sustainability Officer, handled the sustainability reporting session.